I was first introduced to kimchi in college. A friend of mine asked me if I “knew about it:” this stinky pickled salad that was good for digestion. He then whipped out a jar of Sunja’s Spicy Kimchi, opened it and let the odor fill the dorm room. It wasn’t until I was a farm apprentice several year later that I started making it and consuming it on a regular basis. First I had to get over my fear of fermented foods. Sam, always ahead of me, started reading about fermenting vegetables and proposed that we start making our own sauerkraut and pickles. He gathered grape leaves, oak leaves, and juniper berries, supposed to help keep the cabbage fresh and crisp, and stuffed salted shredded cabbage into jars with the different natural preservatives. He covered the jars and stuck them in the root cellar, periodically checking on them and then reporting back. About 10 days later, he declared them “ready” and asked if I wanted some. I was convinced that they were poison and refused to partake. It wasn’t until I read Sandor Katz’s Wild Fermentation that my fears were allayed. I decided to make kimchi following the directions in Wild Fermentation, adding carrots and just a hint of spice from hot pepper’s we’d grown and dehydrated. It was that first batch that really got me hooked. I am not sure what it was about the flavor that felt like home to me. It certainly wasn’t like anything I had every really eaten. I grew up in a food culture of home cooked spaghetti and meatballs. For the next few years, I was on a pickling kick. 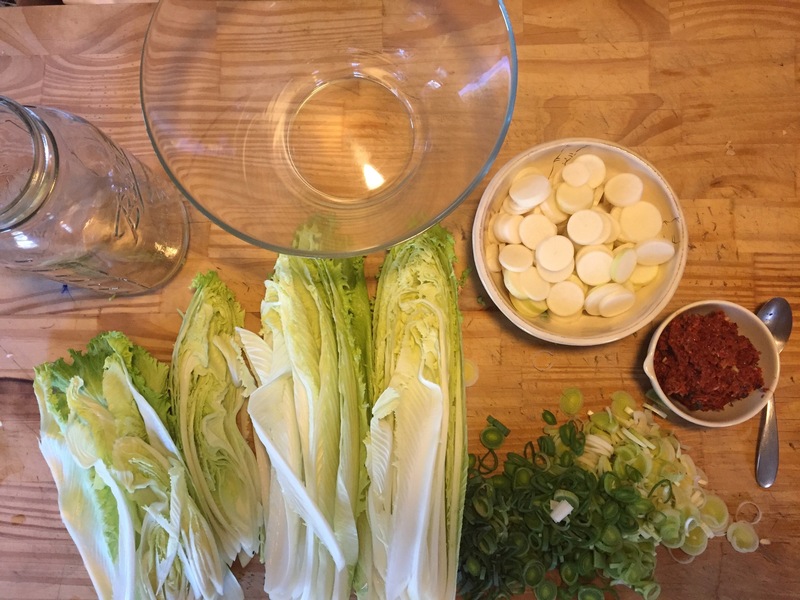 When running Second Wind CSA, I led a few fermentation workshops and made 20 gallons of kimchi at a time. That kimchi was really pickled vegetables with some spices, in the years since I have honed in on what I like most: very pungent, spicy pickled cabbage and daikon with a bit of added seaweed for extra umami. The technique and guide I am outlining here is for an intermediate skill level. I make a salty, pungent, fiery paste and slather on prepared vegetables, then weight the mixture down and let it ferment for 5-7 days. If you have never facto-fermented anything before let me know and I will try to share some key tips here. Makes 1 quart finished kimchi. Step 1: Make the paste. Chop half of the total leek you are using, half of one large shaft, or the shaft of a small leek. Rinse to remove any dirt. 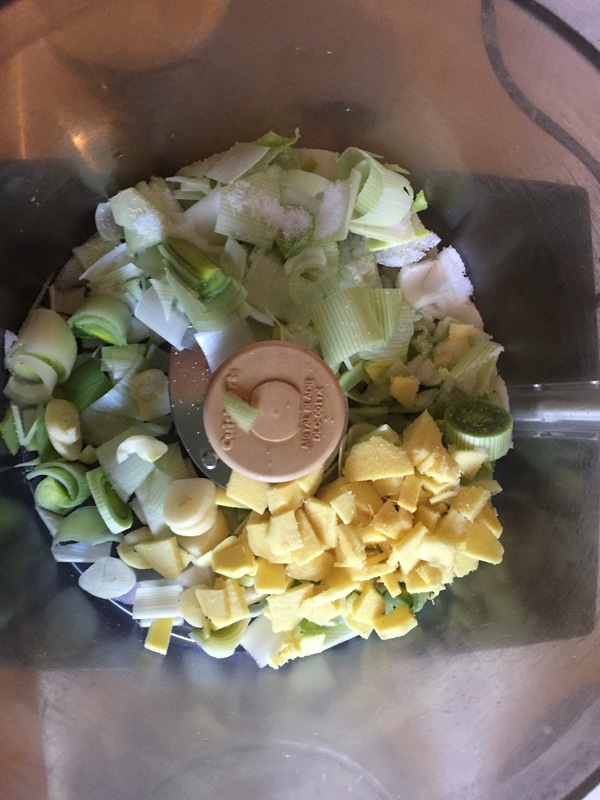 Place chopped leek, garlic, ginger, strip of wakame, if using, and 1-2 tablespoons of salt into food processor and process until a smooth paste. 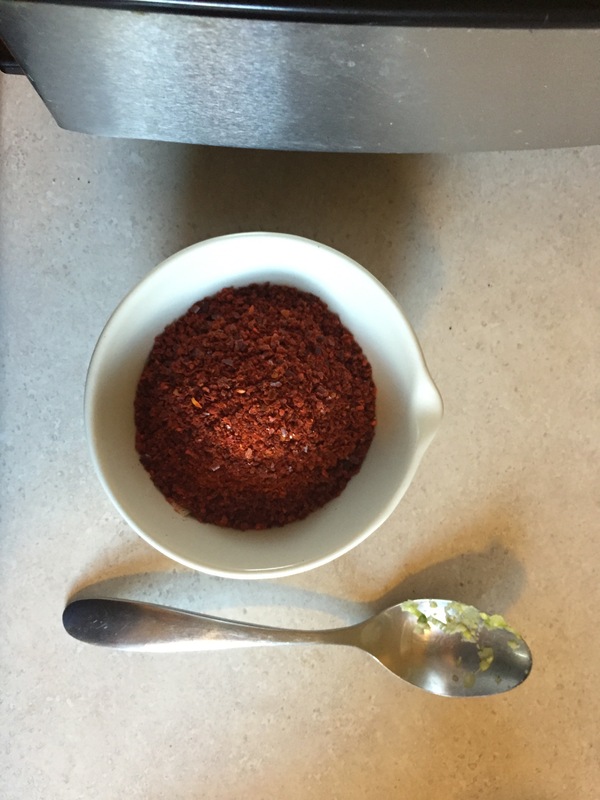 Add the red pepper to taste-the more you use, the hotter the kimchi. Process until a smooth paste forms. Taste to make sure it is salty. Step 2: Prep the vegetables. Scrub or peel the daikon, trim the roots and slice into disks, about 1/8 thick. Cut the Chinese Cabbage in half, remove the core at the base, and inspect for blemishes or dirt, and rinse the leaves. Shake off excess water and cut each half lengthwise, then cut in opposite direction into 2″ thick pieces. Slice the remaining leek into thin slices, using all the nice look greens as well. Toss all vegetables together in the bowl, making sure they are well mixed. Step 3: Slather on the paste. You might want to put on gloves for this. Scoop the paste into the bowl, and, using your hands, work the paste all over the vegetable. I use a quick massaging motion, scooping the bottom of the bowl often to make sure everything gets coated. Now, taste one of the vegetables. It should taste salty, but not insanely so. Add more salt if needed. Step 4: Pack the jar and ferment. Pack the 1/2 gallon ball jar with your mixture, and compress down as much as you possible can. Weight the top to keep the mixture submerged once the liquids express. Use a 1/2 pint ball jar is you are using a 1/2 gallon ball jar, or a plate and weight if using a crock. Wipe down the sides and edges of the jar. Leave kimchi on the counter. Check in about 12 hours to make sure the liquids have expressed and the vegetables are submerged. Let ferment for 5-7 days, checking and tasting periodically. The flavor should go from salty to fermented-pickle. Once you last it and you really like the flavor, its time to pack it into a jar. This recipe should make about 1 very tightly packed quart. Place a lid on it, label it and keep it in the refrigerator. It should keep for several months, if you can make it last that long.